Dan Lord is a forty-year-old private detective with a law degree working the blurred line between right and wrong in the Nation's Capital. As a self-employed solutions broker and legal consultant, he works for a very select clientele. He doesn t advertise and only takes cases on referral. But when two people close to him are murdered, Dan's work becomes very personal. With the assistance of a newly hired female intern, extracting clues from a ladder of acquaintances, Dan bounds through both the underbelly and elite of society, each step bringing more questions and yet ultimately taking him closer to the answer he seeks. A bail bondsman, a recluse hacker, a court clerk, a university student, an old-school barber, a high-class madam, an intelligence officer, a medical doctor, and a police detective are among the list of people Dan must cajole for help. His quest will lead him to discover things he never wanted to know, and put him in the position to reveal things that important people would prefer remain unrevealed. 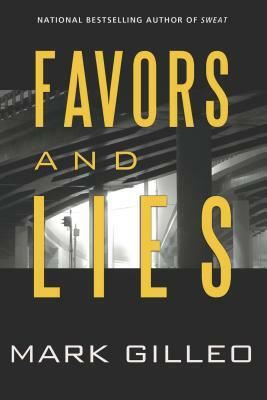 Tense, ingenious, and filled with the unforgettable characters that have become a Mark Gilleo trademark, FAVORS AND LIES is the most thrilling novel yet from one of the great new voices in suspense fiction. Mark Gilleo has a graduate degree in international business from the University of South Carolina and an undergraduate degree in business from George Mason University. He enjoys traveling, hiking and biking. He speaks Japanese. A fourth-generation Washingtonian, he currently resides in the DC area. His books have received numerous awards and literary recognition, including: Winner of a National Indie Excellence Awards. Winner of the 2014 Beach Book Festival. Finalist in the 2014 International Book Awards. Runner-Up for Fiction in the San Francisco Book Festival and the New York Book Festival. Finalist and semi-finalist in the William Faulkner-Wisdom creative writing competition.